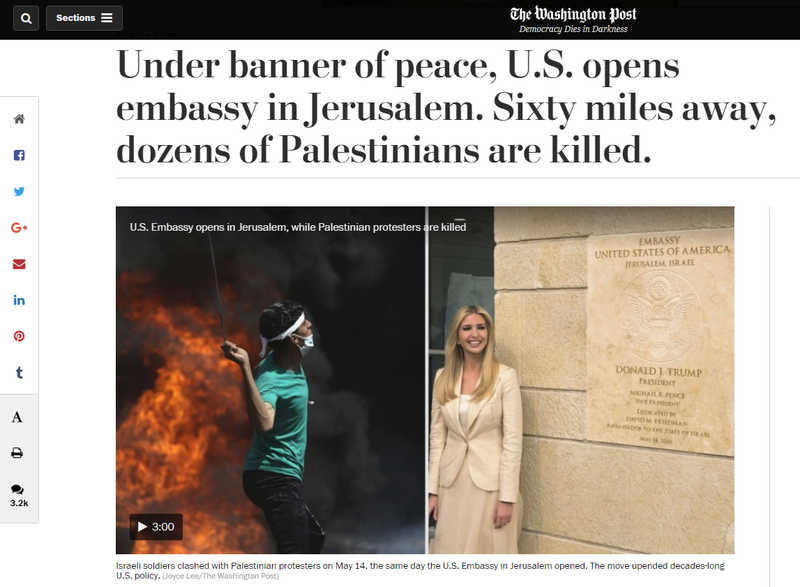 A screenshot taken of a May 14, 2018 article on The Washington Post Website shows an image of a Palestinian protester in Gaza next to another of Ivanka Trump unveiling a plaque at the new location of the American embassy in Jerusalem. This is one of many split-screen images that could be seen on traditional media websites and across social media forums. The most significant story of the week came on Monday with the jubilant celebration of the relocation of the American embassy in Israel from Tel Aviv to Jerusalem simultaneously juxtaposed by the violent attacks on Palestinian protesters by Israeli forces along the border with Gaza. Protesters had been gathering for weeks at the border in the lead up to Israel’s Independence Day on May 14th, which in 2018 marks the 70th anniversary of the founding of the state of Israel, which is referred to as the Nakba, or catastrophe, by Palestinians. The stark contrast of the two events dominated the headlines throughout the week and resulted in an array of divided opinions and diplomatic disputes. The decision to open the embassy on such a contested and sensitive date was seen as provocative and antithetical to peace negotiations by both the Palestinians and regional leaders, but the Washington Post reported that, “successive speakers who took the stage at Monday’s ceremony said that they firmly believed the embassy move was long overdue and was, in fact, a positive step toward peace.” In Gaza, more than 60 Palestinians were killed and around 2,700 injured by fired live ammunition, tear gas and firebombs by Israeli forces, barely 40 miles away, where around 40,000 Palestinians gathered to protest along the Israel-Gaza border. President Trump son-in-law and Middle East adviser Jared Trump noted that, “as we have seen from the protests of the last month, and even today, those provoking violence are part of the problem and not part of the solution.” The city of Jerusalem is a contentious question as it’s claimed by both Israelis and Palestinians. Many reports have been written about this particular subject so below are a few of the many developments relating to Monday’s events using a variety of sources. The international community has criticized Israel for failing to comply with international law, requiring them to protect the population of Gaza. The UN Security Council met on Tuesday and condemned the indiscriminate use of force by the occupying forces, and voted to send an international war crimes probe to Gaza. The Arab League held an extraordinary meeting in Cairo and they also demanded an independent investigation into the violence, while Saudi Arabia’s foreign minister expressed his support for the Palestinians’ fight and deplored Trump’s decision to move its embassy. Meanwhile, Paraguay and Guatemala followed the American lead and relocated their own embassies to Jerusalem. Turkey recalled its ambassadors from Israel and the United States, and South Africa also withdrew its envoy from Israel. On Wednesday, the Palestinian Foreign Ministry recalled its ambassadors to Romania, the Czech Republic, Hungary and Austria, to protest their participation in the embassy celebrations. On Friday, Turkish President Erdogan hosted an emergency summit of the Organisation of Islamic Cooperation (OIC), urging Muslim leaders to show greater unity in supporting the Palestinians in combating Israel’s brutality. Israeli Prime Minister Netanyahu, on the other hand, claimed that Israel acted in self-defense and tweeted that, “Every country has an obligation to defend its borders.” U.S. Secretary of State Mike Pompeo shared that opinion, and according to President Trump, it was a “great day for Israel.” The White House explicitly blamed Hamas, the Sunni militant group governing Gaza, for the violence as well as the Palestinians’ deaths. Israel have also portrayed the protests as a terrorist play planned in detail by Hamas. The Israeli Defense Forces accused Iran of paying demonstrators to approach and harm the Gaza barrier. The U.N. High Commissioner for Human Rights acknowledged that some Palestinian demonstrators tried to damage the fence but still condemned the deadly violence and said the deaths could not be justified. Since the beginning of the protests on March 30, about 112 Palestinians, including children and women, have been killed and over 13,000 injured, while only one Israeli soldier was reported wounded. Even though the Palestinians are enraged about the decision to move the U.S. embassy and refuse to negotiate with the Trump administration, Washington believes that recognizing Jerusalem as Israel’s capital brings the Arab-Israeli conflict one step closer to a resolution. Many analysts and scholars argued otherwise, noting that the United States was demonstrating a clear and polarizing bias towards Israel (read views from The Atlantic, The New York Times, The Baltimore Sun, Reuters, and The BBC on how the embassy move affects the prospects for peace and the likelihood of success of Trump’s “ultimate deal”). The Jordanian Foreign Minister Safadi urged the EU countries to recognize East Jerusalem as the capital of the Palestinian State, underlining that an independent state on Palestinian territory is essential for peace in the region. With the abundance of rhetoric and opinion, it is easy to lose sight of the impact of policy and conflict on families and communities. We encourage readers to explore first-person narratives, photo-essays and short films to gain insight on the lived experiences of the conflict. Outside of Gaza and Jerusalem, there were other notable events. On Tuesday, the holy month of Ramadan officially started. Fasting during Ramadan is one of the five pillars of Islam, when Muslims, whose health permits, must abstain from drinking, eating and sexual activities from dawn until sundown. This is to mark the anniversary of the revelation of the Quran and to stimulate reflection on human frailty and dependence upon God, focus on spiritual goals and values, and reflect on the less fortunate. To alleviate the suffering of the population of Gaza, the Egyptian President El-Sisi made the rare decision to open the Rafah crossing on the border with Gaza during the entire holy month, enabling the Palestinians to leave the occupied territory. Al Jazeera made a reportage about Syrian refugees feeling extra vulnerable in absence of their family members during Ramadan. Watch the video here. To impress you Muslim friends, here are 10 Ramadan greetings to learn. On Saturday, Iraq’s electoral commission confirmed that the bloc led by an Iraqi cleric whose opposition to the presence of American troops was a top reason Washington withdrew its forces in 2011 has won the country’s parliamentary election. The success of populist Shiite cleric Moqtada al-Sadr’s party was a shocking upset to the status quo. Sadr is a long-time adversary of the United States who also opposes Iranian influence in Iraq. 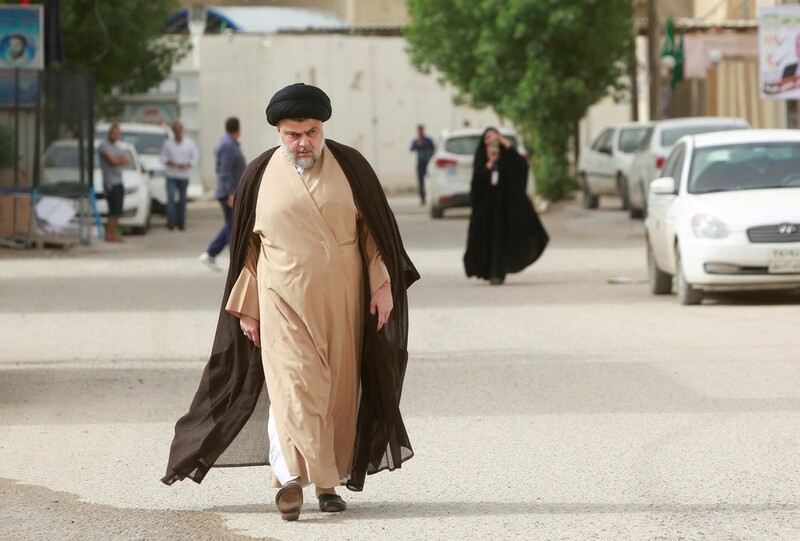 Sadr himself cannot become prime minister because he did not run in the election, though his bloc’s victory puts him in a position to have a strong say in negotiations. The bloc captured 54 parliamentary seats out of 328. The Victory Alliance, headed by current Prime Minister Haider al-Abadi, trailed in third place with 42 seats, behind the Al-Fatih bloc — allied with Iran — which won 47 seats and heads an umbrella group of paramilitaries that played a key role in defeating Islamic State. The results were announced a week after Iraqis voted in a nationwide election, which produced surprising results amid a historically low turnout. Sadr was able to capitalize on growing resentment over Tehran-backed governments who have failed to improve basic services and build hospitals and schools in a country devastated by the war against Islamic State and by sectarian bloodshed. He and his bloc emphasized Iraqi unity over sectarian affiliation. Reuters reported that the party’s success was a remarkable comeback for Sadr, who for years had been sidelined by Iranian-backed rivals and was regarded by U.S. and Iraqi officials as an unpredictable maverick. On Sunday, several unemployed Libyan youths vowed to shut down oilfields in Marada, a town in eastern Libya unless demands for better state services were met by the government. An oil engineer reported to Reuters that despite the threat, oil production was running normally through the pipeline feeding Es Sider oil terminal, which runs near Marada. The statement of the youths complained about an absent state, lack of health care and other services, and a lack of roads linking the town to other communities, Reuters reported. The youths were also demanding jobs at a state oil firm.